Parmesan Romano Panko Herb Crusted Chicken Breasts | Mommy, I'm Hungy!! I tried another new recipe tonight and it was pretty good, but I was so rushed because I had a mom’s night with our playgroup and so I was rushing to get dinner done because as usual, it takes longer than the recipe says. Once I got dinner done, I had to rush to make my dessert to take to mom’s night, which is posted here, and I didn’t even feel like eating, but I did take a few bites and this chicken was amazing!! 1. Trim your chicken breasts of any excess fat. Take a piece of plastic wrap and cover your chicken breasts. Pound them out with a mallet until they’re about 1/4″ thick. 2. In a large deep sided pan (I used my chicken fryer) over medium-high heat, put enough olive oil to pan fry your chicken breasts. 3. WHILE your oil is heating, place panko flakes into a pie dish (or another dish large enough to bread your chicken). Add Parmigiano, basil and season with salt and pepper. Mix together with a fork. 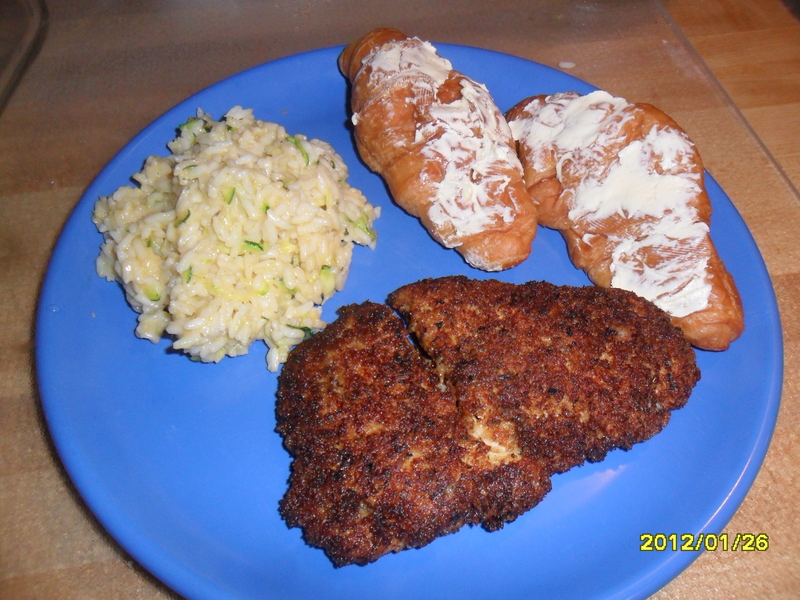 Press chicken breasts into Panko mixture, breading chicken on both sides. Continue until all chicken is breaded. It took a little more than 3 minutes for me, but then I had the stove on medium heat. When I turned it up to medium high, or a little above, they browned really quickly and didn’t get done in the middle, so I had to cook a little longer and the breading got a little more browned. They really were good and I plan on making them again when I’m not so rushed. I made Cheesy Zucchini Rice with this and it was really good too!! As always, let me know if you make this and how you like it! I love comments! !